Great news in my opinion! Hopefully we'll hear a full Q2 announcement from Eureka soon...my guess is end of this week, and if not, by the end of next week. First Fuller I saw, and I absolutely loved it. Very excited to pick this one up. I hope there are a few more extras on it, but I will still buy it if there aren't. One of my favs of Fuller - will certainly be getting this Blu to replace my Criterion DVD. Eureka on Facebook wrote: Due to a last minute problem that we have found with the master, our release of PICKUP ON SOUTH STREET is having to be delayed until 17 August 2015. We shall be announcing a replacement title for release in May in a few days time. Oh well... I was psyched to renew my love affair with this film. It's been a couple of years since I've seen it. A masterpiece beyond measure-- a film with balls the size of a couple of beached whales. What you said, and it's also my favourite Fuller. Schreck I never mentioned privately but - thinking of Widmark - there's a terrific German BD of Night and the City. The PQ is altogether different and far better than either the Criterion or the BFI DVDs, much more authentic grayscale (no black boosting like the Crit) and the gorgeous fine grain image which is all extremely sympathetic to the fabulous exterior London photography which looks like most of it was done in magic hour, apart from the interiors. You still need to keep the Criterion SD if only for the wonderful 30 minute vid piece on the English and US scores and the slightly different cuts. I wish BFI would let the Brit version out of the damn cage. They hold the only 35mm copy I understand. If I recommend Fuller to anyone new to his work, this is the one I tell them to start with, especially to those likely to be put off by the typical roughness of a B-movie or the extreme tones of Fuller's more audacious films. In that respect, this one seems more conventional, but I don't mean that as a knock - it's still a great film and one of his best. I'm not sure what my favorite Fuller film would be, but the shortlist would definitely include this, The Steel Helmet, Park Row and White Dog. Shock Corridor feels like a quintessential Fuller film, and only he could have made anything like it. I don't think it's his best, but I know plenty have cited it as a favorite. david hare wrote: What you said, and it's also my favourite Fuller. And what you said: South Street has long been not only my favorite Fuller's but among my favorite noirs outside of that critical period of the 1940's. The film completely lacks the low budget lunacy of no-holds-barred-throw-the-viewer-through-a-plate-glass-window titles like The Naked Kiss or Shock Corridor (I am NOT a fan of White Dog, but I positively adore Shock and Kiss and Underworld and Park Row and Baron and Jesse James and...), and yet Fuller's personality is so powerful that it is just as much on display here despite pushing through the fit and finish of having made the film at Fox. His love of the seedy and the obscure, the off-to-the-side characters who lived on the fringes of NYC is just as authentic here despite the sets and glimmering surface. I love the man. When I first saw the film I wanted to live in Skip McCoy's shack. As for Night and the City--another critical Wid, who never really got ongoing sustained attempts to demonstrate the breadth of his talent. Although he's playing a gangster/hustler and a loser, his character here is far more sympathetic and shows a heart in the unfolding. It's torturous listening to Dassin talk about the fact that he wanted to do Shakespeare with Wid . . . but never got to do it. Authentic greyscale: this is turning into one of my biggest pet peeves nowadays, right up there with grain zapping. I was watching the restoration demonstration of Dracula on the Uni blu... they show before/after shots of the vintage nitrate lavender print which was struck from the original neg back inna day, and the "after" of the film after digital processing. The difference is far beyond schnazzing the film up to make it look like it did when it was released: the blacks and the whites in the film now were simply not possible back in the early 1930's pan-chro. The slow lenses, the insensitive film stock . . . the absolute digital blacks and the pure, bleached digital whites are leagues away from what resided on original release prints. The kicker is the restoration manager sitting in front of the camera during his moment to be a star, saying "We have access to tools nowadays that the director did not have back when he made his film but almost certainly would have taken advantage of if he could," that's a paraphrase because I'm at work but very close . . . the gist is "we know the director would have used what we have used to erase filmic phenomena on the visual and audio plane, and enhance the image into unnaturally dark blacks to make the atmosphere Extra Creepy Freund." Those modified greyscale palettes may be nice for atmosphere on a vintage horror film in general, but screwing with the contrast of a very carefully photographed film, which emerged from a very specific technological era--this is like "restoring" a van Gogh by applying a newly developed oil paint to the stars in Starry Night: "This kind of brightness in paint was not available to Vincent back when he painted the stars, but since we have access to technology he did not, we are going to use these brighter titanium and zinc whites available now, because we know he felt that technology fell short of his goal and would have used these tints if he could have." Irks me. These "restorers" and "preservationists" are really servicing the juvenile general market who find any tramline or scratch unacceptable and any contrast short of today's standards a complete abomination. They're servicing sales, not the filmic history of the title. They say they're trying to bring the film back to the state of its original release; what they're actually doing is trying to make the film look like it was released yesterday, not eighty some odd years ago. I like Pickup on South Street quite a bit, but my favorite Fuller is actually The Crimson Kimono. That picture is very overlooked and underrated, to my eyes. James Shigeta's performance in the film is really exceptional, and the film repays the complexity of his character's feelings with a clever and intensely crafted story. True, lots of the acting is ham-fisted, and the minor characters are given some very on-the-nose dialogue to deliver, but part of the charm of the film for me is how the best actors in the cast are given the best lines and the most to do. Also, the picture is very raw and it has some very interesting things to say about race in the United States––especially through the use of Kojaku and Bancroft as unequal "blood–brothers." That the killer confesses in the end to the same feelings of insecurity and alienation that Kojaku felt is a remarkable and unusual identification, and something I think Fuller should be better known for having identified. Add to that the beautiful rendering of Los Angeles' Little Tokyo district, the wailing jazz score and the unprecedented love scene in the middle of the movie, and the film is a treat from start to finish. Plus, the film is full of actual Japanese-American performers playing Japanese-American roles––something that was still unusual in its day. I hope this one eventually makes it to blu-ray, as will the higher-profile Fuller titles. But I'm thrilled for Pickup on South Street all the same! HerrSchreck wrote: Irks me. These "restorers" and "preservationists" are really servicing the juvenile general market who find any tramline or scratch unacceptable and any contrast short of today's standards a complete abomination. They're servicing sales, not the filmic history of the title. They say they're trying to bring the film back to the state of its original release; what they're actually doing is trying to make the film look like it was released yesterday, not eighty some odd years ago. Awful to hear this. You see this all the time with reissues of vintage music - usually brick-walling and drastic equalization. I'm not that familiar with the original look of vintage film stocks, especially when prints can vary so wildly in quality depending on the way they're struck, but the thought that vintage films may be "modernized" for home viewing has crossed my mind before. I imagine contrast boosting is typically the culprit. Schreck if you want a look at Nitrate era 30s blacks and grays and fine grain Grover Crisp's team has done exemplary work on both It Happened One Night and Only Angles Have Wings for which they were accessing fine grain nitrate preservations. The replication of , particularly, those dusky blacks is sublime. Also in this league Criterion's 34 version of Man Who Knew Too Much for which they started with a nitrate 35mm print owned by Robert Harris. A lot of this is in that ballpark. It's astonishing to see those sorts of tonalities and textures again - I haven't seen any nitrate prints of anything since the early 70s. Just asked Craig Keller on Twitter, and he confirmed for me that this release will be coming from the same 4k restoration that is playing at Film Forum in June. Great news! Well, bluray.com gives it perfect marks and from the looks of a still like this one black levels look very fine indeed. There's nothing whatsoever wrong with black levels in this. The image can't be faulted for blacks, grayscale, stability, grain management, density. It's basically as good as it could ever be. The audio is also stupefyingly clear and present, after years of compressed mono. Another great anti-Commie Chinese-ish pentatonic-ish score from Leigh Harline. He was the perfect composer for Fuller I think. For the recod while I think it's largely a superb new 4K there are a handful of quick wide and medium shots(four or five) which look soft and relatively light on grayscale but these may be inherent to the source. I assume the postponed August release was to accommodate this new 4K from Fox. It was worth it. Fyi: David, I asked Craig on twitter if availability of the 4k restoration had been reason for the delay and he said it was unrelated. Fox definitely has House of Bamboo. It's been licensed to Optimum just like Pickup was before MoC released it. HJackson wrote: Fox definitely has House of Bamboo. It's been licensed to Optimum just like Pickup was before MoC released it. Finally got around to watching the blu-ray of this film which is absolutely superb, and everything I remember loving about the film the first time around was still present. Perhaps I spoiled Fuller for myself...this was the first Fuller film I watched and it still strikes me as his best and most effective. Fuller frequently has us rooting for people who are far from "innocents", but the way he does it here, with Skip is perfect. 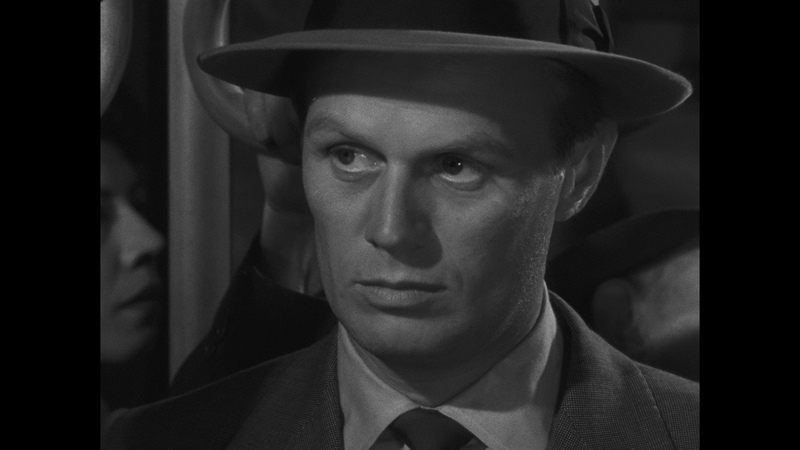 Widmark is absolutely sensational and never holds back. I admit that many of the films I've watched, I've only seen once, and I need to revisit so many. That said, something that strikes me in many noirs is we are given a protagonist who is discovering the depth of the plot as he goes along, and we are learning it with him. I find sometimes when films use this character, they try to balance out his cluelessness in the face of a conspiracy with his eventual violent awakening, and it doesn't always hit the right note for me. There is no such ambiguity with this film. Widmark is 100% sure of himself at all times, and even with the depth of the conspiracy is discovered, he doesn't slow down, but only changes his goal a bit. As the film becomes more about a survival/justice story than outing a conspiracy, everyone from the police to the villains is acting so perfectly and on all cylinders that the execution is phenomenal. Great blu ray, perfect film.